The Bandhavgarh Tiger Reserve in MP has come up with a system that facilitates visitors to identify its big cats by their features, contrary to the pan-Indian norm of denying open access to such details. 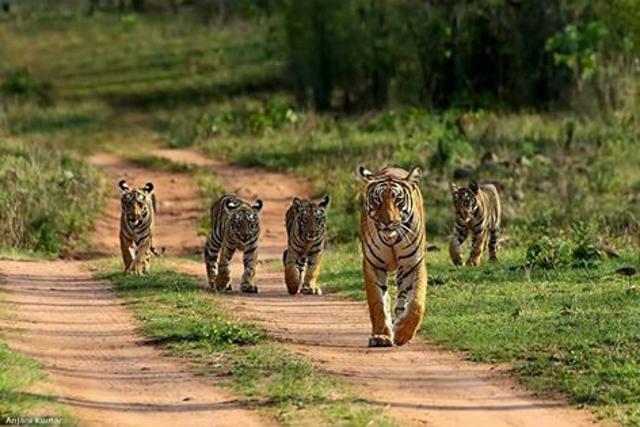 The national park in northeast Madhya Pradesh provides a tiger identification book on 24 tigers roaming in the 106-sq-km area that permits tourists. The printed manual lists photographs of each tiger in different angles, with their unique stripe pattern and other attributes. Each of the 2,500-odd tigers in the country’s 49 reserves has a unique ID as per guidelines of the National Tiger Conservation Authority, but facts about the animals are not publicly available. Deviating from the practice, the 1968-founded Bandhavgarh reserve in Umaria district permits visitors to identify tigers by describing their distinct stripe markings — and even know their lineage, local name, year of birth and litters borne in the case of females. Won’t sharing tiger identities make things handy for poachers? No, says Raman, pointing out that the book features only 24 tigers largely seen in the core. The Bandhavgarh reserve along the Vindhya-Satpura ranges of central India has a total of 61 adult tigers and 12 sub-adults living across its steep ridges, undulations, forests and meadows. The identification book project constituted a board of editors that included assistant conservator of forests (Bandhavgarh Tiger Reserve) SS Sendram, Wildlife Institute of India senior research fellow B Navaneethan and Vidya Venkatesh from Last Wilderness Foundation besides Raman.